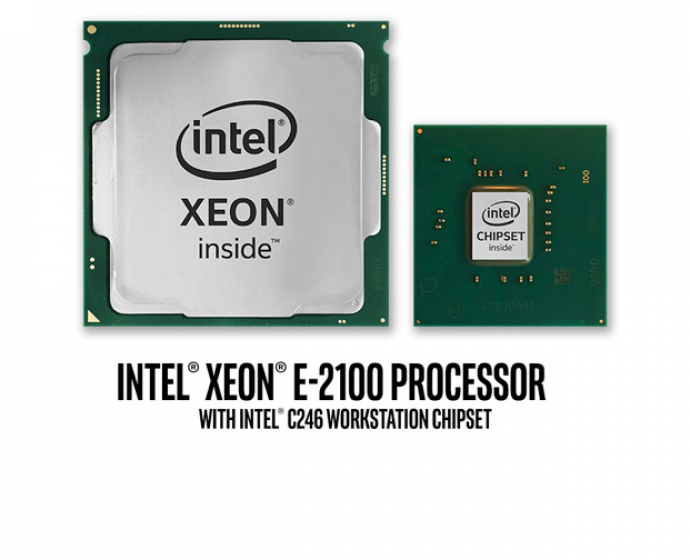 Intel has taken wraps off its new Xeon E-2100 entry-level workstation processor family. The 6C/12T Xeon E-2100 is a derivative of the 14nm++ 'Coffee Lake' architecture and is tailored for creative professionals looking at a low-cost workstation CPU that offers improved single-threaded performance along with faster DRAM and higher PCIe lane counts. Intel has announced a new class of entry-level workstation CPUs. Dubbed the Xeon E-2100 family, these CPUs are successors to last year's Xeon E3 v6 processors that were based on the 'Kaby Lake' architecture. Intel is taking a staggered approach to upgrade its Xeon lineup. Earlier this year, Intel announced the Xeon W-2100 series targeting mainstream workstations and the Xeon D-2100 series catering to datacenters and edge applications. Now, the company is introducing the Xeon E-2100 series for entry-level workstations to complete the portfolio. All the new Xeons are derived from what Intel calls the Xeon Scalable Processor (Xeon-SP) platform. As mentioned earlier, Intel is segmenting the new Xeon processors depending on the target audience. Intel claims fairly significant performance boosts in this generation across Xeon-SP, Xeon W, and the Xeon E families. All the new Xeons are workstation versions of the 8th generation 14nm 'Coffee Lake' cores. The lineup starts from the Xeon E-2176M and Xeon E-2186M for mobile workstations and scales all the way up to what Intel refers to as the 'Expert' segment with the Xeon-SP dual-socket processor. The focus for the launch today is the revamped Xeon E family. The Xeon E can offer up to 6 cores and 12 threads and support up to 64 GB ECC DDR 2666 MHz RAM. There are also some SKUs with integrated Intel UHD Graphics P630 and are designated 'G' in the name. The highest SKU in the series, the Xeon E-2186G can offer a base clock of 3.8 GHz and a single core turbo of up to 4.7 GHz. TDP for the Xeon E-2186G is 95W while the rest of the SKUs sport a TDP between 71-80W. Intel confirmed to us during the press brief that the Xeon E does not use a soldered thermal interface material and still relies on the polymer thermal interface material. Since this is an entry-level CPU, there is no dual-socket support. To complement the new CPU, Intel has also announced the C246 chipset. Although, the LGA1151 socket remains unchanged, older motherboards sporting the C236 chipset are not compatible with the Xeon E-2100. Intel confirmed that the C246 integrates the wireless AC module to free up some PCIe lanes. Thus, if you are planning an upgrade to the new Xeon E, be prepared to invest in a new motherboard. Speaking of PCIe lanes, the Xeon E-2100 supports a maximum of 40 PCIe 3.0 lanes with 16 of them coming directly from the CPU. There was no clarity on whether the USB controller is also integrated on the C246 chipset itself, but we should get to know about that soon. The C246 chipset supports the standard suite of Intel technologies such as vPro, Optane memory, Rapid Storage, and Thunderbolt 3. While we will have to test out the CPUs ourselves to see the performance improvements in this generation (no seeding of review units to the press, unfortunately), Intel did put out some relative numbers during its presentation. For starters, Intel claims a 1.36x gen-to-gen improvement and a 1.73x improvement over a 4 year refresh. Those are relative numbers and are hard to quantify in absolute terms but it does seem that the new generation Xeon E does merit a consideration, especially if you haven't upgraded in quite some time. Intel also boasts close to a 1.5x performance improvement over the Xeon E3-1200 v6 in financial, compute, and 3D modeling applications. However, there have been no performance claims shown with respect to the AMD Ryzens or even the 'Skylake-X' Core i7-7800X. Intel is confident (understandably) that their offerings are better what Ryzen can offer and the platform has undergone extensive testing and validation with various ISVs making it a much more compelling option than a similarly priced 'Skylake-X' CPU. The new Xeon E-2100 family consists of 10 SKUs starting with the quad core Xeon E-2124 and going all the way up to the Xeon E-2186G. Those SKUs that have 'G' appended to their names have integrated Intel UHD Graphics P630. The P630 is not too different from the consumer UHD Graphics 630 offering except that it has undergone validation with ISVs for performance compliance. That said, all the workloads that these CPUs target will hugely benefit from a discrete GPU but it is good to know that you can get fairly capable integrated graphics just in case. The quad core Xeon E-2124, the Xeon E-2124G, and the hexa-core Xeon E-2126G do not support hyper-threading. We are not sure why a workstation-class CPU would even be offered without support for hyper-threading but it is what it is. Apart from both the Xeon E-2124s (8 MB L3 cache), all others sport 12 MB L3 cache. 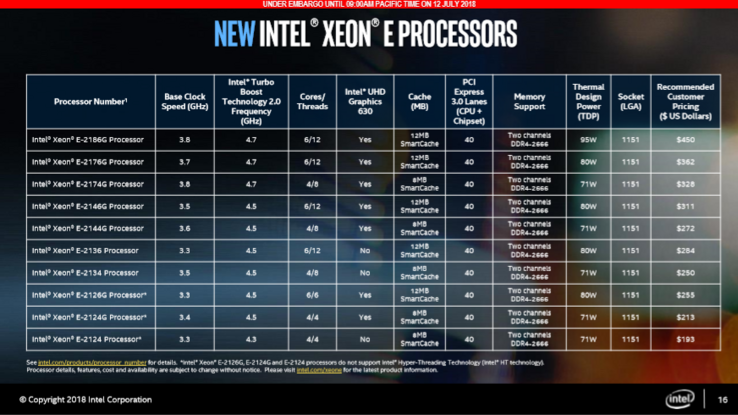 Price-wise, the new Xeon E-2100 is in line with that of its predecessors. Recommended customer prices start from US$193 for the Xeon E-2124 and top out at US$450 for the Xeon E-2186G. For perspective, the 4C/8T Xeon E3-1285 v6 was priced at US$450 while the 4C/4T Xeon E3-1220 v6 was priced around US$193. PCs equipped with the Xeon E-2100 are available now for shipping from the likes of Dell, HP, and Lenovo who will be offering the Precision 7910, the Z8 G4, and the Thinkstation P920 workstations respectively. What’s New: Intel today announced the release of the new Intel® Xeon® E-2100 processor. 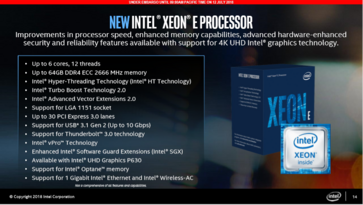 The Intel Xeon E processor, successor to the Intel Xeon E3 processor, is designed for entry-level workstations that provide creators with powerful, single-threaded application performance with a platform optimized for reliability and affordability. Why It’s Important: The new Intel Xeon E processor delivers a powerful combination of performance and capabilities for entry-level workstations. They are architected and crafted for the demands of creative professionals. Compared with its predecessor, the new processor offers higher max turbo frequency, faster DRAM speeds, enhanced I/O, and advanced security and reliability features. These processors are available with Intel® UHD graphics supported by a broad set of workstation applications? 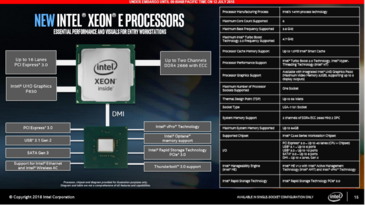 How It’s Different: The Intel Xeon E processor a 6-core processors for entry workstations. The combination of two additional cores and higher single-core turbo frequency delivers increases in performance across workstation benchmarks as compared with previous 4-core entry workstation processors. The processor offers Error Correcting Code (ECC) memory, a key feature to maximize data integrity, to help improve system stability and to reduce the possibility of silent data corruption. Where it Works: Workstations powered by Intel Xeon processors meet the highly diversified demands of creative professionals in fields such as architecture, engineering, media and entertainment and financial services. The Intel Xeon E processor is the latest addition to Intel’s portfolio of workstation-optimized processors, which also includes Intel® Xeon® Scalable processors (delivering breakthrough dual-socket performance for the most advanced workstation professionals), and Intel® Xeon® W processors (targeting mainstream workstations with a combination of performance, enhanced memory capabilities and hardware-enhanced security and reliability features). When/Where You Can Get It: OEMs will begin shipping Intel Xeon E-2100 processor-based systems today. For information, visit Intel.com’s workstation page. Software and workloads used in performance tests may have been optimized for performance only on Intel microprocessors. Performance tests, such as SYSmark and MobileMark, are measured using specific computer systems, components, software, operations and functions. Any change to any of those factors may cause the results to vary. You should consult other information and performance tests to assist you in fully evaluating your contemplated purchases, including the performance of that product when combined with other products. For more complete information visit www.intel.com/benchmarks. Configuration: Results have been estimated or simulated using internal Intel analysis or architecture simulation or modeling, and provided to you for informational purposes. Any differences in your system hardware, software or configuration may affect your actual performance. Intel, the Intel logo, Intel Xeon, Intel Optane and Intel vPro are trademarks of Intel Corporation or its subsidiaries in the U.S. and/or other countries.